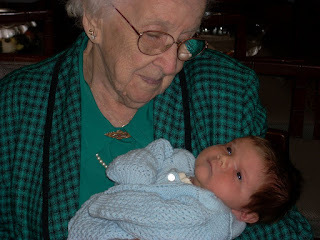 On February 9, 2009, in her 97th year. Devoted daughter, beloved sister, dear Aunt Hazel, unsurpassed friend. Miss McIlvride trained as a Registered Baby Nurse at the Hospital for Sick Children in the 1930's. Upon graduating, Dr. Alan Brown sent her into homes to care for the sickest of his patients. Through her nursing, Nanny shared her light with thousands of children over seven decades. She left a legacy of love through the dolls and afghans she made and the G-d bless you hugs she gave. Funeral on Monday, February 16, 2009 at 1pm at Calvin Presbyterian Church, 26 Delisle Ave. Toronto, where her devoted friends will surely miss her. In lieu of flowers donations may be made to Calvin Presbyterian Church, 416-923-9030 or to the Hospital for Sick Children, 416-813-5320. Hazel is now truly with the angels.